August 20, 2018 Dan O.
Killer robots? You don’t say! After Grey Trace (Logan Marshall-Green) is mugged and effectively paralyzed in a mugging, he sets his sights on one day, hopefully, finding those responsible for ripping apart his body and killing his wife. And of course, it’s going to take tons and tons of therapy for Grey to eventually get his life back on-track, so he’s got plenty of time to think, right? Well, it turns out that Grey has a billionaire friend who has created this intelligence implant known as STEM. What it does is it takes over Grey’s body and allows for him to move his whole body again, however, it’s just under the control of the artificial implant itself, making it a bit tricky for Grey to have full-control over hid body the way he would want. But whatever it does, it gets Grey back on his feet and ready to catch the bad guys who ruined his life and this is when things start to not just get tricky for Grey and the law, but for STEM too, which seems like it may have more sinister intentions at play. Passionate pecks on the lips before going to work every day? Not good! 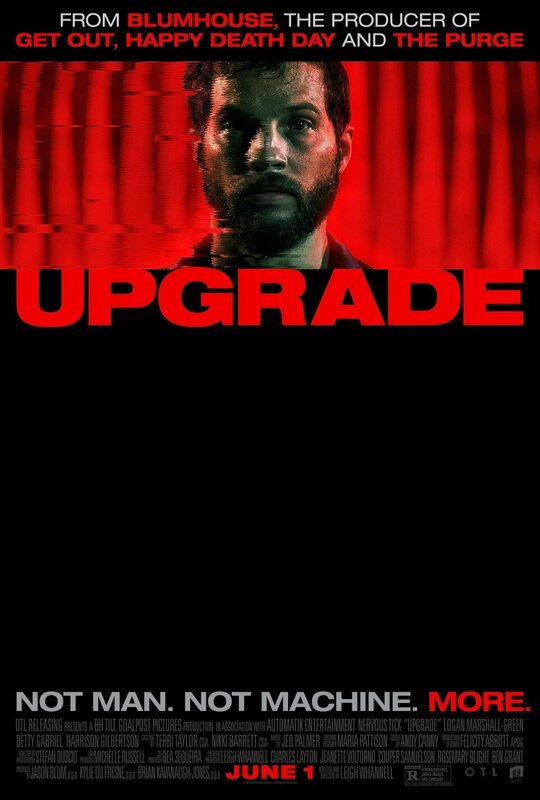 Upgrade is the kind of movie that takes everything you know and love about iconic sci-fi films, takes them together, ties them up, and rather than make it seem like a soulless copy cat, actually embraces the ideas that these movies have given to the world of storytelling. Writer/director Leigh Whannell has sort of played with this idea throughout his whole career, but now, with Upgrade, it seems like he’s truly having fun, enjoying himself, and oh yeah, firing on all cylinders. Though he may be much more of a horror-guy, Whannell shows that these creepy scenarios can truly have an exciting look and feel to them, even with the darkness peering in from the outside. Basically, it’s nothing like Saw, which is a great thing. It also helps that Upgrade keeps itself moving and never fully backs down from taking chances. Due to its small-budget, Whannell seems like he was able to get away with the meaner, much more darker places that this material gets into, making it feel like the perfect sci-fi movie made by and for adults, but also still revels in the pure spirit and fun of watching someone get their heads caved-in by a robotic-arm. It’s just the right amount of pulp and classiness that makes it feel like an 80’s movie, but made for the 21st century. Which is definitely a good thing, especially when you have a movie that doesn’t always feel the need to please everyone. But don’t get me wrong, Upgrade is still no doubt a crowd-pleaser – it’s fun, exciting, a little silly, and always filled with something cool and slick to look at. It is still, though, a cautionary-tale about the dangerous effects technology can have on a society, especially when it becomes overly reliant on it and even though the movie likes to have fun with that idea and poke some fun at it, still, the message remains: Don’t trust robots to take over your life. Consensus: While it takes many ideas from other, more well-known sci-fi flicks, Upgrade still works being a fun, thrilling, and rather interesting take on the revenge-thriller subgenre. Cheer up, man. It’s the future. Everything’s crappy. Great review! I first watched the trailer for this about 2 days ago, and now it’s my most hyped film — glad to see it lives up to it!